We think you'll find the information contained in this newsletter to be a valuable tool for enhancing your Internet experience. As always, we appreciate your feedback and suggestions. Please send your thoughts, comments or questions to newsletter@gmavt.net. Each month, we raffle off a prize from a local business, so be sure to enter your name every month for your chance to win. 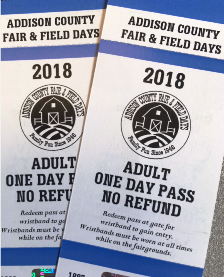 This month we have another great prize for you, so be sure to enter for your chance to win a pair of tickets to the Addison County Fair and Field Days. The drawing will take place on August 2. Click here to enter for your chance to win tickets to the Addison County Fair and Field Days. Waitsfield and Champlain Valley Telecom is seeking a motivated individual to join our team. We are currently looking for a Customer Service and Internet Support Associate for our Waitsfield location. For more information and to apply, visit http://www.wcvt.com/company/jobs/. Just about every day, our Technical Support team hears from customers concerned about whether or not emails are legitimate. Phishing emails are typically fraudulent emails that are purposely designed to look like they are coming from legitimate businesses which can make them harder to spot. Remember, Green Mountain Access will never send an email asking for you to verify your account information or asking for your password. If you ever are in doubt about the legitimacy of an email, just give us a call. For your convenience, we've put together the following tips to help you determine whether or not an email is legitimate. 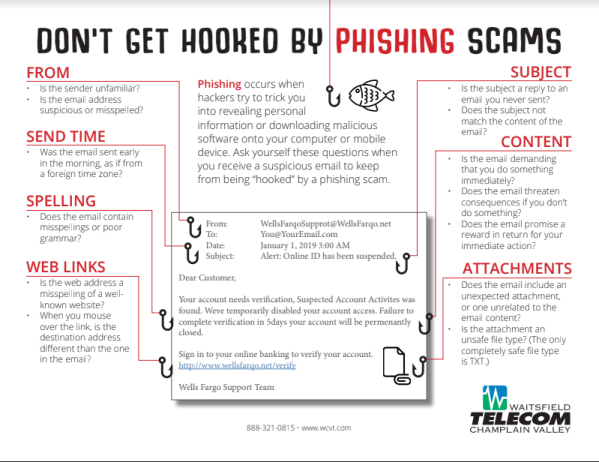 You can view the full size PDF here: http://www.wcvt.com/wp-content/uploads/2018/07/WCVT-Phishing-Awareness-Handout-2.pdf. And remember, the safest thing to do with a suspected phishing email, is to simply delete it. 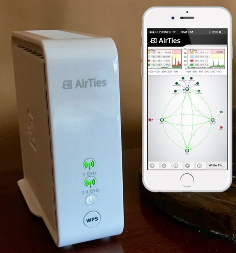 More Connected Devices = A Need For Better Wi-Fi? Depending on the size, layout, and construction materials used in your home, a single access point solution may not provide you with adequate coverage. Our Whole Home Wi-Fi fixes that by using multiple Access Points. One of our expert technicians will optimize your Wi-Fi by placing Wi-Fi access points at strategic locations around your home to expand coverage, eliminating dead spots, and providing great performance for all of your streaming devices. Whole Home Wi-Fi from Green Mountain Access is just $10.90* per month, plus installation, and includes two AirTies 4920 ac Wi-Fi access points. Additional Wi-Fi access points can be added for $5.45* per month for each additional access point if needed for your specific installation. Have a question, or want additional information, visit http://www.wcvt.com/services/wi-fi/residential/ or contact Richard at 496-8360 to learn more about our Whole Home Wi-Fi or business Wi-Fi solutions. *Whole Home Wi-Fi equipment requires Green Mountain Access high-speed Internet service and a modem/router. Installation fees apply. 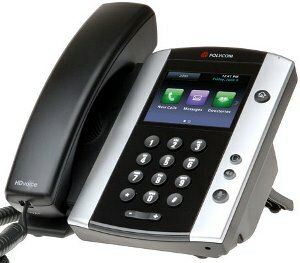 A reliable and efficient phone system is essential for your business to stay connected to your customers. You don’t want to think about it too much; you just want it to work so you can focus on your business. With Hosted IP Phone Service, you don’t have to purchase, set up, or maintain your own phone system; we take care of that for you. Instead, you get a powerful, business-class phone system with expanded capabilities and mobile options that will grow with your business. 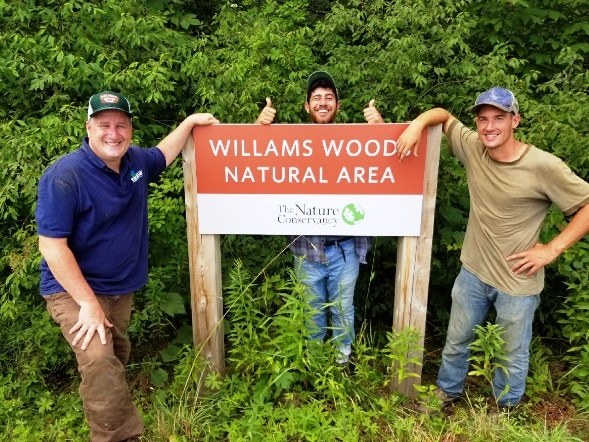 Waitsfield and Champlain Valley Telecom employees recently assisted other Nature Conservancy volunteers witth trail maintenance in the Williams Woods Natural area in Charlotte. 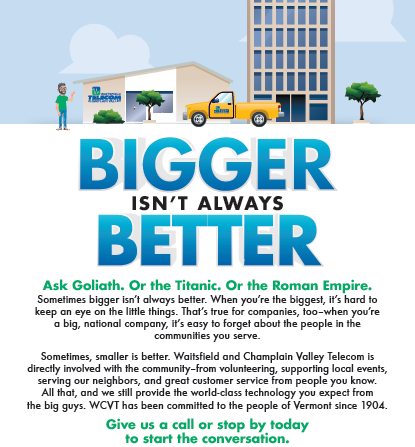 Waitsfield and Champlain Valley Telecom provides each employee with sixteen hours of community service time yearly to be used on local service projects. If your organization has a project in the making and is looking for help, contact Lorraine Keener at 496-8379 or lkeener@corp.wcvt.com to discuss the possibilities of WCVT participation. Don't miss Vermont's largest agricultural fair in New Haven. Children's barnyard, cattle judging, tractor pulls, rides, crafts, exhibits, live entertainment, pony and ox pulling, midway, parade, youth activities, and Vermont products dinner. For more information, visit www.addisoncountyfielddays.com or visit them on Facebook at www.facebook.com/addisonfielddaysvt. Every year the Hinesburg Recreation Department presents the Summer Concerts in the Park music series. Concerts are held Wednesday evenings at 6:30 p.m. throughout July and early August at the gazebo behind the Hinesburg Community School in Wainer Park. Waitsfield and Champlain Valley Telecom is proud to be a sponsor of the Hinesburg Concerts In The Park. The Bristol Recreation Department is once again showing classic films on a theatre sized screen on the Bristol Green – a drive-in experience without the driving! Free and suitable for all ages. Bring a blanket and your bug spray. Waitsfield and Champlain Valley Telecom is proud to be a sponsor of Movies In The Park. For more information, contact the Bristol Recreation Department at 453-5885 or bristolrec@madriver.com. To avoid getting scammed, do your homework including a thorough Google search. Contact the local tourism office to confirm the existence of a business. Pay with a credit card so you can dispute the charge if there's a problem. And look for vacation rental websites that offer money-back guarantees. Short Tutorial / FAQ - What's The Safest Way To Set Up Security Questions For Online Accounts? Question: I've heard a lot about how to create a secure password, but I'm unsure of how to answer security questions when signing up with a new service online. What's the best way to do it? Answer: In a word, lie. Answers to common security questions such as "What is your mother's maiden name?" and "Who was your childhood best friend?" can be researched by hackers, especially if they have access to your social media accounts where you routinely post information about yourself. The challenge with this strategy is that you may not remember the answers you make up. One way to resolve this issue is to have standard "replacement" answers to certain questions. For example, when asked your mother's maiden name, you could use the last name of a favorite TV character. When asked your childhood pet's name, you could use your favorite type of dog. Another good method is to use a password manager, which allows you to create and store secure passwords as well as record security question answers. To be extra secure, consider posting less private information on social media and using privacy settings to make such information visible to fewer people. August is National Peach Month, and you can celebrate by discovering new ways to use this delicious fruit in your cooking. How about Crab Salad With Peaches, No-Bake Fresh Peach Pie, or Pork Chops With Peach Sauce? Don't forget to visit the Canning and Freezing sections to enjoy summer's peaches all year. Help your kids get off to a great start in the new school year. Visit this site to find useful articles, product recommendations, book lists, worksheets, and other tools. Discover 10 Ways to Motivate Your Child to Learn, Helpful Tips for Chaperoning School Field Trips, and much more. Taking a great photo is just the beginning of creating a beautiful electronic image. BeFunky includes hundreds of effects including oil painting, pop art, and the Cartoonizer®. Use them to spice up your photo or make minor corrections to lighting, blurriness, and other common problems. Your kitchen is one of the hardest-working rooms in your house, and this site can help you give it a little TLC. Find ideas for color schemes, layout ideas, and remodeling decisions you'll never regret. Check out the kitchen storage section for clever ideas to get more out of your food prep space. From 0 To 18 In Five Minutes - This touching video chronicles the growth of a girl from infancy to age 18 with video clips captured weekly. 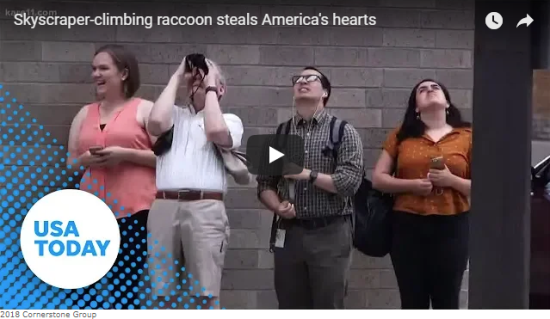 Raccoon Scales Skyscraper - A raccoon captivates locals in St. Paul as it ascends the outside of the Minnesota Public Radio building. You haven't started pinning on Pinterest yet and you want to get started? To sign up, go to www.pinterest.com. We have used our best efforts in collecting and preparing the information published herein. However, we do not assume, and hereby disclaim, any and all liability for any loss or damage caused by errors or omissions, whether such errors or omissions resulted from negligence, accident, or other causes. ©2016 Cornerstone Publishing Group, Inc.